Don’t throw the baby out with the bathwater! Traditional print marketing still has an important role to play in getting the word out to potential buyers. 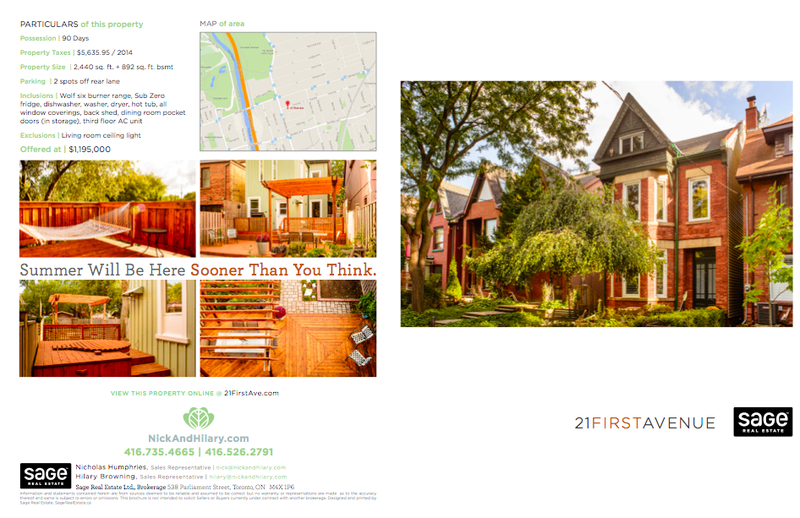 Our talented in-house marketing team uses proven strategies to create compelling print campaigns that generate buzz, fill open houses, and ensure that every agent in the city knows the ins and outs of our listings. Once buyers are in your home, give them something to remember! A feature sheet full of bright, beautiful photos is still the perfect way to put key selling features front and center. We also feature a Q&A with you, the current homeowner, to let buyers in on all the perks and benefits of the house and neighbourhood, along with detailed floor plans allowing buyers to visualize how they would use the space, and whether or not their heirloom credenza will fit by the front door. Buyers appreciate a takeaway that they can look over with their friends and family. Buying a home is a big decision; give them everything they need to choose your property. 6% of buyers come from friends and neighbours. That might sound like a small amount, but we don’t think it should be ignored. With over 90,000 home sales* in 2014 alone, that 6% can go a long way towards getting you the best price. Taking the Just Listed postcard a step above what you might see daily in your mailbox, we invite the neighbourhood to tour the property during your open house. It’s their chance to take a look and call any friends or family members they want to be their new neighbour! Wait a Second, What’s Really Being Sold Here? Don’t let your print marketing do a better job selling your agent than it does selling your listing! We believe that printed materials should focus on showcasing your property, not your agent’s face. Every flyer, feature sheet and postcard puts your home front and centre and directs interested buyers back to a customized website where all of their questions will be answered.